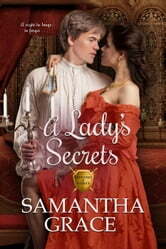 Penniless and stranded abroad, Lady Adele Sinclair's survival depends on her brother's ability to charm the ladies. After Adele meets the man of her dreams and he makes an offer of marriage, she's certain her struggles have come to an end. However, when one of her brother's assignations turns dangerous, the siblings must flee for their lives, separating Adele from the only man she has ever loved. Jaded by betrayal, Marcus Fletcher spends his days at the Drayton Theatre, a small London Playhouse, attempting to forget the lady who left him. When Lady Adele shows up at the theatre expecting him to honor their betrothal agreement, he must decide if he will play the fool for her again or possibly lose the only woman who has ever been able to break down the walls around his heart. Loved the story of Marcus and Adele. I wasn't sure how they were going to be brought together in the end with everything going on! I do want to see her brother's get a story, I'm just not sure I can forgive Marcus..
Samantha Grace writes a wonderful romantic tale of love and trust for Marcus and Adele. Also tells of importance of family for the both of them. I'm looking forward to Samantha's next tale.